The community of Halsted is located about six and one-half miles east of La Grange near the Fayette Power Plant. The fertile Colorado River bottom is located a short distance to the south. Halsted was first settled in 1824 by George Duty, a member of Stephen F. Austin’s Colony, who was granted the land by the Mexican government. Other early settlers were Placide Heller and B. December, a relative of Joseph Biegel, who founded another nearby community, now covered by the waters of the power plant cooling lake. Heller and December also received Mexican land grants in the area. In 1839, R.E.B. Baylor, a Baptist minister, judge and congressman, named the community Halsted. Many of the early settlers were of German-French extraction from Alsace-Lorraine, France; some later settlers were of Czech origin. In addition to those mention, other early settlers were C. Halfinger, L. Struve, Robert Pohl and Mrs. A. Wolle. Later arrivals included the Leglers, Huebels, Nitschkes, Hattermans and Polaseks. After marrying Mary Heller, the daughter of Placide Heller, John Wessels came to Halsted and built a general store in 1896. It was located next to the railroad and had an attached concession stand between the store and dance hall, which he also built. The Wessels also owned and operated a saloon located on the north side of the railroad and a lumberyard, gin, seed house and blacksmith shop on the south side of the tracks in the area of the mercantile store and dance hall. The Wessels’ gravel pits were located on 500 acres of land where the power plant is now located. Gravel was shipped by the MKT and Taylor, Bastrop and Houston Railways. In the early years, the railroad gravel cars were loaded by means of a scraper full of gravel being pulled up a ramp by mules and dumped through a trap door into the rail cars. The mules were then taken down the other side of the ramp to reload the scraper. In later years, a dragline was used. Halsted had a post office in 1900 located in the Wessels store, a telephone connection and daily mail, plus railroad freight and passenger service. The post office was discontinued in 1906 when rural route mail delivery was begun. Garland Wessels, the oldest son of John Wessels, was the first and only train master of the Halsted depot, which he first operated from the general store. The actual depot was built in 1914 on the north side of the railroad; it closed twenty-two years later. Land for a school was also donated by John Wessels. The teachers taught only German. After the turn of the century, children from the Biegel Settlement also came to school at Halsted. There were approximately 18-20 students. John Wessels and his wife Mary built a beautiful two-story home in Halsted in 1894. Mary always had a very nice yard with a greenhouse filled with many unusual plants. In addition to owning the 500 acres where the gravel pits were located, John Wessels also owned 150 acres between Halsted and present-day Highway 71 and leased 1000 acres in the river bottom on which sharecroppers, living in tenant houses, raised cotton and corn. In 1925, a hurricane damaged the store, which was rebuilt. Unfortunately, two devastating fires later destroyed all of the businesses of Halsted. The dance hall and gin were lost in the first fire. Around 1940, the lumber yard and general store were destroyed in a second fire. A smaller mercantile store was built on the site of the saloon after the second fire; it now stands in ruins. 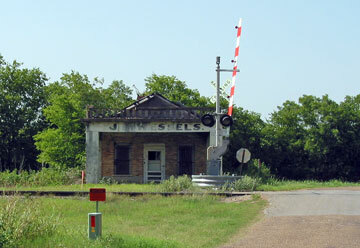 That store, the depot and home are the only remnants of a town no longer in existence. There is a sign on Highway 71 indicating the road to Halsted, but it is misspelled “Halstedt”. An old photo of some of the buildings in Halsted shows a sign on one of the buildings that clearly validates the correct spelling of the town name. Halsted is the name of a station about six and a half miles east of La Grange on the Missouri, Kansas & Texas Railroad and two miles and a half north of the Colorado River. The immediate surrounding country is sandy postoak and gravel and serves mostly for pasture, but a short distance south of it lies the fertile Colorado River bottom and north of it the very fertile Rutersville prairie. In its immediate neighborhood lie also some very fertile Rutersville prairie. In its immediate [sic.] neighborhood lies also some very fertile bottom lands of Baylor and Wuerzner's Creek. Halsted is a postoffice and has telephone connection, daily mail and freight and passenger service. Mr. J. H. Wessels established his mercantile business at that place in 1896. He is also the proprietor of a saloon, a large lumber yard and a first-class gin, equipped with all modern improvements. In fact, he and his employees are Halsted. In 1900 it became a postoffice. The voting is done at Biegel. The neighborhood of Halsted was settled long before the place was established. Among the oldest settlers of the neighborhood, P. Heller, C. Halfinger, B. December, L. Struve, Robt. Pohl, Mrs. A. Wolle may be mentioned. The population is German with a sprinkling of Bohemians. Halstead was a railroad station on the MKT Line east of La Grange. Settled by one of Austin's "Old 300," George Duty, it became a meeting place for the French Alsations and Germans. R. E. B. Baylor, (a member of the Baylor family who founded Baylor University in Waco), a judge, Baptist minister, and congressman who lived nearby, named the town Halstead.... when the railroad arrived, gravel pit operations began by using mule teams to pull the gravel up a ramp to be dumped into the railcars.